What is one of the first steps required to get 150,000 pounds of fresh, organic produce to local food banks? Plowing the soil, of course! 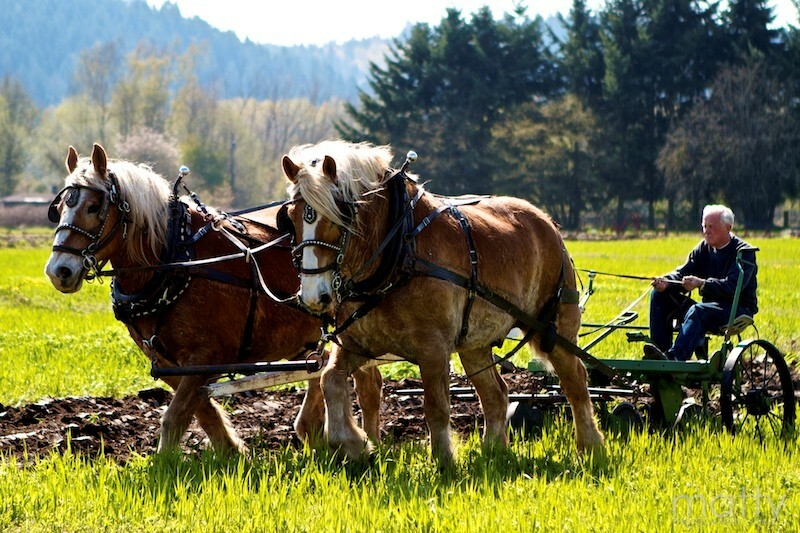 On Saturday, April 7, four to six teams of drivers and plow horses will do just that as they help ready the fields at Mother Earth Farm in Orting for spring planting. The event is open to the public from 10 am until 3 pm, weather permitting. Emergency Food Network operates this 8-acre organic farm, managed by Canyon Little, son of renowned organic farmer, Carrie Little, who owns her own organic farm in Orting. Ms. Little is widely acclaimed nationwide for her ability to skillfully produce higher yields per acre than any other comparable organic facility. This annual event exemplifies the spirit of the Emergency Food Network program of supplying quality nutritional produce to needy families and individuals in Pierce County. Mother Earth Farm grows more than 40 varieties of vegetables, as well as fruit trees, supplying fresh produce to over 60 food banks in our county. Vegetables grown at Mother Earth Farm are harvested and delivered fresh, often on the same day that it is harvested. In turn, these food banks feed nearly 150,000 county residents, which is nearly one-in four members of our community. In addition, bees are kept on site at Mother Earth Farm to help pollinate the crops, and their honey is collected for distribution as well. Besides supporting the food banks with fresh organic produce, the Emergency Food Network also supplies general foodstuffs as well. Further, the EFN also provides food to meal sites and shelters throughout Pierce County, helping ensure the well-being of children, seniors and adults. In 2011, the EFN provided 13.1 million pounds of food valued at $16.1 million to 67 food banks, meal sites, and shelters throughout Pierce County. In case of rainy weather, attendees of the Draft Horse Plow Day at Mother Earth Farm are encouraged to check EFN’s website (www.efoodnet.org) for rescheduling of this event. 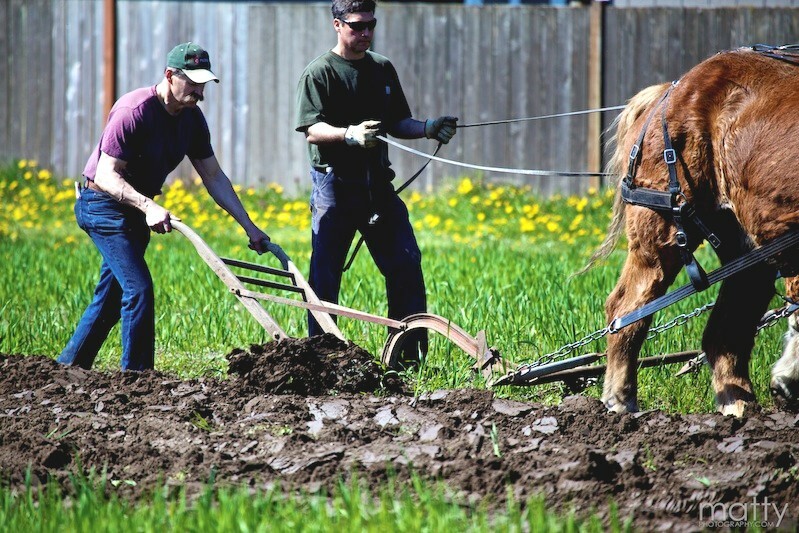 The teams of draft horses are unable to plow the fields in muddy conditions. Directions to Mother Earth Farm in Orting, from Tacoma and north: Take HWY 512 (to Puyallup) and follow signs east to Highway 410 East (Yakima/Sumner) exit. Follow 410 to second Sumner exit (Valley Avenue/Orting-Highway 162); and turn right at stoplight at end of exit ramp (toward Orting). Drive approximately 1.9 miles (past Alderton and Spooner Farms) to 102nd. Look for gravel road on left – Mother Earth Farm sign will be at entrance to 102nd. Farm is at the end of the gravel road on the right. For more information, visit www.efoodnet.org, or call the Emergency Food Network: (253) 584-1040. This entry was posted in Business, Culture, Environment, Events, Orting. Bookmark the permalink. Great story Bruce! I will plan on taking my family to share in this experience. Beautiful and heart warming! Many Blessings to you brother!